Rose Garrard trained as a sculptor at Stourbridge, Birmingham and Chelsea Schools of Art and was awarded a British Council Scholarship to the Ecole des Beaux Arts in Paris where she won the Prix d`Honneur de Paris Gold Medal for Sculpture in 1971. Her work extended into installation, multi-media, performance, video and audio pieces. 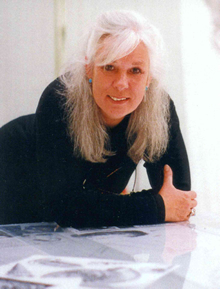 For thirty years she received many further awards, curated group exhibitions and exhibited in major galleries both nationally and internationally, including in the Institute of Contemporary Art, the Victoria and Albert Museum, the Tate, the Serpentine and the Hayward Galleries and abroad in the Venice Biennale, at the Museum of the 20th Century Vienna, the Vancouver Art Gallery, the Messenhallen West Berlin and in many other cities across the world from Europe to Australia. As well as also being commissioned to make many public art works, she has created four artist’s works for television companies, has appeared frequently on TV and has also written many articles for art magazines and catalogues. In 1988 Rose was seriously injured in a motor bike accident and had to give up lecturing, but to aid her recovery she undertook a series of four artists' residencies as durational live-works or 'conversation pieces' in Britain and Canada, each lasting for one month. The Cornerhouse Gallery in Manchester mounted a major retrospective of her work in 1994 a year after which Rose moved her studio from London back to the Malvern Hills. In response to local newspaper appeals for ideas to help regenerate Great Malvern, she proposed “The Spring Water Arts Project”, the creation of a new sculpture trail to reclaim lost spring sites throughout the town. In 1997 she undertook a two-month artists' residency here and was then commissioned to create two spring water sculptures to mark the town centre. Since then she has worked tirelessly to research, promote and help raise funding for the restoration of another 18 spring water sites around the Malvern Hills, which will be completed in 2008. She has also written and published two books on forgotten aspects of Malvern’s history connected with the springs, spouts and holy wells, often uncovering the lost activities of women here. Rose Garrard was born in Bewdley, Worcestershire, her family moving to Malvern when she was three months old. For many years her mother was the proprietor of Collector’s Corner, an antique shop in Malvern. Her father who combined life as an artist with a career as a soldier, ran the Middle East College of Art in the Sahara Desert after the Second World War to rehabilitate officers to civilian life, receiving the MBE in 1953.